Suicidal ideation is believed to be part of a constellation of suicidal behaviours that culminates in suicide. There is little information on the cross-national prevalence of all suicidal ideation or of serious suicidal ideation in spite of its likely public health importance. A two-stage screening approach of over 12,000 adults from the general population were evaluated by face to face interview to identify those meeting ICD-10 criteria for depressive disorders at eight sites in five European countries. This study is a cross-sectional analysis of item 9 (suicidal ideation) of the Beck depression inventory from the total screened sample. The standardised period prevalence for all suicidal ideation varied from 1.1 to 19.8% while for serious suicidal ideation there was much less variation. 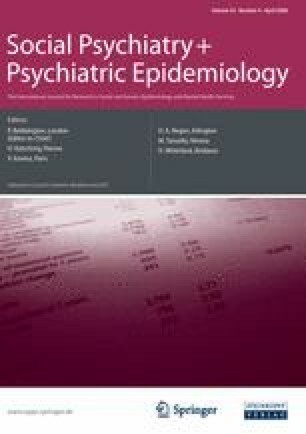 Examining the inter-relationships between all suicide ideation, serious suicide ideation, depressive disorders and suicide failed to support a seamless transition from suicide ideation through depression and serious ideation to suicide. Strategies to prevent suicide should be tailored to take account of site specific differences in its aetiology and understanding the path from suicidal ideation through depression to suicide is crucial to this. We wish to extend our thanks to the following agencies who provided us with the local area suicide rates–Vital Statistics Dept, Central Statistics Office, Skehard Road, Cork, Ireland; Mortality Team, Office for National Statistics, 1 Drummond Gate, London SW1V 2QQ, England; Instituto Naciolal de Estadist, Madrid, Spain; Statistics Finland FIN-00022 Statistics Finland and the Norwegian Institute of Public Health. We gratefully acknowledge funding from the EC Biomed 2 Programme (contract no. RDO/18/31), the Spanish Fondo de Investigación Sanitaria (contract no. 96/1978 and 02/10069), the Wales Office of Research and Development (contract no. RC092), the Norwegian Research Council, the Council for Mental Health, the Department of Health and Social Welfare and the Finnish Pensions Institute of Agricultural Entrepreneurs (contract no. 0339). JL Ayuso-Mateos received additional funding from the Spanish Ministry of Health ISCIII-RETIC RD06.